Sigma Delta Pi is pleased to announce its chapter project grant program, which accepts applications year-round on a rolling basis. A chapter of active status—at least one induction of new members during the three-year period prior to the date of the planned chapter project—that has not been named an “Honor Chapter”/”Capítulo de Honor y Mérito” during the same three-year period may apply for a grant of up to $300 to support a chapter project that complements the mission of Sigma Delta Pi. The Chapter Project Grant Program is intended to spur chapter activity and thereby help raise the chapter’s visibility in its college/university community. To be eligible to receive a project grant, a chapter must be of active status: at least one induction of new members during the three-year period prior to the date of the planned chapter project. 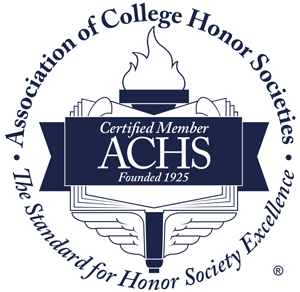 Any chapter named “Honor Chapter”/”Capítulo de Honor y Mérito” at least during the same three-year period in question is ineligible for a chapter project grant. The Chapter Adviser must e-mail the complete application and supporting materials no later than one month prior to the scheduled chapter project to Mark P. Del Mastro, Executive Director of Sigma Delta Pi. The proposal must include a detailed description of the proposed project and a budget. The Executive Committee will consider the quality of the proposal and the specificity of the budget, in addition to the merit of the proposed activity. Applications less than one month prior to the planned project will not be considered. Members of the national Executive Committee will review the applications independently with a given set of criteria and will select the grant recipients on a rolling basis. The Committee’s decision will be final. The Executive Committee reserves the right to award the number of grants it deems appropriate while considering application merit and available funding. The Committee will consider the quality of the proposal and the specificity of the budget. Active participation by student members in the proposed project as well as the project’s creativity as related to Sigma Delta Pi’s mission will receive special consideration. All applicants will be notified no later than two weeks after the receipt of the completed application form. Sigma Delta Pi chapter project grants MUST be used solely for the purposes stated in the chapter’s original application. Permission will not be granted to alter the originally proposed chapter project plan. Sigma Delta Pi’s chapter project grants are non-transferable. Grant monies will be sent to each awardee no later than two weeks prior to the scheduled chapter project and depending upon the project’s schedule. Chapters must propose only one activity/project, but they may submit a joint proposal for a cooperative activity with other chapters. The judging committee views cooperative proposals favorably, but a joint project is not a requirement for this program. WHAT IS NOT FUNDED: Rental of campus meeting rooms, campus publicity, a project previously funded by a Sigma Delta Pi Chapter Project Grant, honoraria or any other payments to your own faculty or to Sigma Delta Pi officers or Council members, excessive travel costs for outside speakers, excessive decorations such as flowers, event receptions (e.g., food and refreshments), the purchase of Sigma Delta Pi merchandise, or any activity that presents obvious danger to students or to others. Students should seek university support for their projects in the form of meeting space, expect local faculty to participate without payment, and make use of campus publications to advertise their projects. The judging committee encourages proposals that plan to obtain additional or matching funding from other sources. LIABILITY: If a proposed activity involves student travel, the proposal must affirm that the travel will be in accordance with university policies and that due diligence will be exercised with respect to the safety of the students. THE NATIONAL OFFICE OF SIGMA DELTA PI DOES NOT PROVIDE LIABILITY INSURANCE FOR CHAPTERS OR STUDENT MEMBERS PARTICIPATING IN ACTIVITIES FUNDED BY THESE GRANTS, OR IN ANY OTHER CIRCUMSTANCES. Accounting of the Expenditure of Funds A fully itemized account of how your chapter actually expended grant monies, including copies of all relevant receipts for national auditing purposes. Copy of the Program from the Event A copy of the program from your event or other concrete evidence that the event took place as scheduled. A Check Refunding Unused Portion of the Grant If grant monies remain after the specific grant activity is finished, the balance must be returned (check made out to “Sigma Delta Pi”). There is no penalty for unused funds. Checks should be sent via regular mail to Professor Del Mastro, the Executive Director. Photograph of Event and Essay A project-related photograph (.jpg or .gif file) and an essay (Word format) of at least 200 words in Spanish reporting in detail on the completed project. The photo and report will be published in the subsequent issue of Sigma Delta Pi’s annual journal, Entre Nosotros. Failure to submit the complete “Charter Project Grant Report” will result in the chapter’s ineligibility for any future Sigma Delta Pi project grant competitions. Awardees unable to undertake the project made possible by the grant must inform the Executive Director immediately and return any funding already received.